In the 13th and 14th century, artisans and merchants used to build their homes in the safe neighbourhood of the main castle mounds. More numerous communities of artisans represented a new object in the social landscape because they were not typical in the earlier society of husbandmen and cattle raisers. Quarters inhabited by artisans and their families stretched next to the main political and administrative centres – the castles where dukes resided together with the people constituting their closest environment. Artisans worked to meet the demands of the ducal court. Supposedly, they would sell part of their products or exchange them for daily bread. Archaeological explorations in the Lower Castle in Vilnius and at the Pajauta Valley in Kernavė provide a look at the artisan yard, which is more characteristic for an urban community. The living area of the artisan family was a clearly marked territory limited by fences and streets, hence we call it a yard rather than a homestead, the term more suitable to name the home of a husbandman. 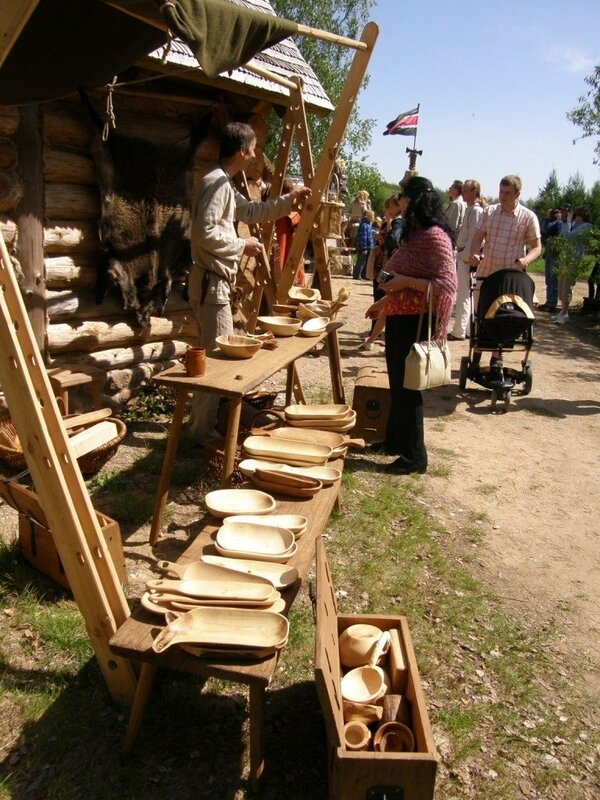 The yard of a local artisan, a bone carver, has been explored in Kernavė. The triangle-like yard of about 900 square meters took its shape in the second half of the 13th century its boundaries remaining unchanged until 1390 when Kernavė was burned down during a Crusader raid. At least six generations must have lived there over that period, but they had no impact neither on the size of the yard nor the arrangement of buildings within it. Scientists unearthed the artisan's tools he used to carve bone as well as his products, raw materials and leavings, all of which indicate that several generations of people were related to bone carving here. Archaeologists enjoyed other kinds of findings in the adjacent yard of another artisan. They have unearthed brass articles, their moulding forms and other items made of different metals – the signs of a jeweller work. Therefore, artisans were involved in specific crafts within their yards and passed their secrets from generation to generation. At least several factors were important in determining the size of the yard. Defensive walls surrounded settlements of that time and earlier cities, such as Novgorod and Kiev. This led to higher concentration of residents and limits for yards the area of which usually did not exceed 400 square metres. From 100 to 150 people lived on one hectare, two to three times less compared to Western European cities of that time. For the artisans of Kernavė, where population density was about 60 people for one hectare, the Neris River and swampy parts of the Pajauta Valley served as a natural defensive "wall". 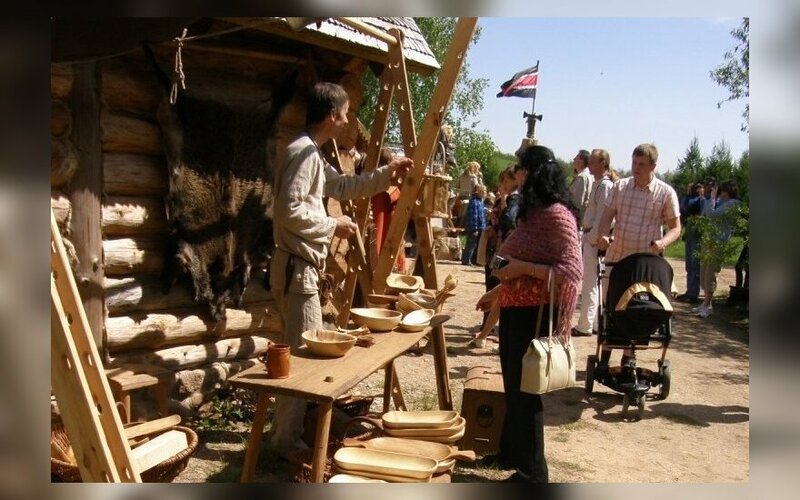 In the Vilnius Lower Castle, artisan yards and wooden buildings that stood there in the 13th and 14th century, suffered in the 15th and 16th century during the construction of stone buildings in that territory. This is why archaeologists were not able neither to draw a clear conclusion about the sizes and boundaries of the yards nor to determine the number of buildings that once stood within them. Nevertheless, it seems that the density of buildings in artisan yards in the small territory between the Gediminas Hill and Neris in Vilnius was higher than that in the wide Pajauta Valley in Kernavė. The cultural layers of the second half of the 14th century indicate that the later the period, the higher was the density of buildings. Deeper layers representing the 13th century and the early 14th century, reveal the buildings erected in a scattered manner and with no obvious order. Some of them stood five to six metres away from the street by, some were built parallel and some at an angle to the street. People would construct buildings by the street in the late 14th century, their one wall resting on the cobbles. It was neither earlier nor later though that they would stick to the tradition of building living houses immediately by the street only, because archaeologists have also discovered small cattle-sheds and other outbuildings along the streets. Artisan yards in Kernavė show no clear order of building locations too. Corners of many buildings, however, correspond to the four cardinal directions. Fences, up to 1.8 metres tall, made of vertical planks or stakes or by pleaching tree branches, separated yards from the street and one from another. People would install single- or two-leaved wickets, usually facing the street, for entrance. Traditionally, the yard accommodated a living house, the largest construction there, several outbuildings and, sometimes, a house for steam bath. Archaeologists were unable to determine the number of yards in the territory of wooden buildings they had explored in Vilnius. They established though that of 25 buildings they had unearthed four were dwelling houses, four were steam baths, two were cattle sheds – judging by the thick layer of dung – and another two were used as workshops or storerooms. The functional purpose of the remaining buildings has not been established, because archaeologists have explored only small parts of them. The yards in Kernavė looked much the same at that time. The yard of the bone carver featured a large (10.4 x 4.4 metres) living house, three smaller (3.3 x 3.4, 4.1 x 4.7 and 4.5 x 3 metres) outbuildings, a stake-supported shed and a cot for cattle. All those constructions, except the cot, were made of logs. The living house stood in the middle of the yard, while the artisan's workshops were located closer to the street. Artisans of Kernavė, Vilnius and other cities often settled down, or were compelled to do so, in rather wet areas. That is why their yards were covered with a thick layer, of up to half metre, of wood chips, pieces of bark and other wood leavings that served as hydro insulation. Archaeologists have also found various leavings related to their crafts beside their workshops. Sometimes artisans laid planks between their buildings and walked them on rainy days. People also tried reducing water in the yard by digging drainage ditches up to half metre deep. Simple open fireplaces were used for a variety of purposes and were common in the yards, as well as thrash pits used, apart from the rest, as toilets. The examination of the upper city in Kernavė revealed that several artisans had plank-walled wells in their yards. Archaeologists have found no traces of trees or other plants, except the remnants of several black alders that grew in the Pajauta Valley, between a steam bath house and a pond. Therefore, the image of a homestead surrounded by flowers is inappropriate when speaking of the artisan yard in the 13th and 14th century.